Description: The Omega Class Destroyers are the largest ships in the Earth Alliance arsenal, and the backbone of Earth Force, the military. They were the first new ship class to be designed and built after the disastrous Minbari war, and they incorporated much new technology. The first Destroyer of the construction line was the "Agamemnon", commanded by Captain John Sheridan. Most of these ships have names based on Greek history and mythology. The Omega class is about 1 km long, and it is equipped with beam weapons, heavy particle cannons, and an anti-fighter defense grid. Like most capital ships, they are not very maneuverable. 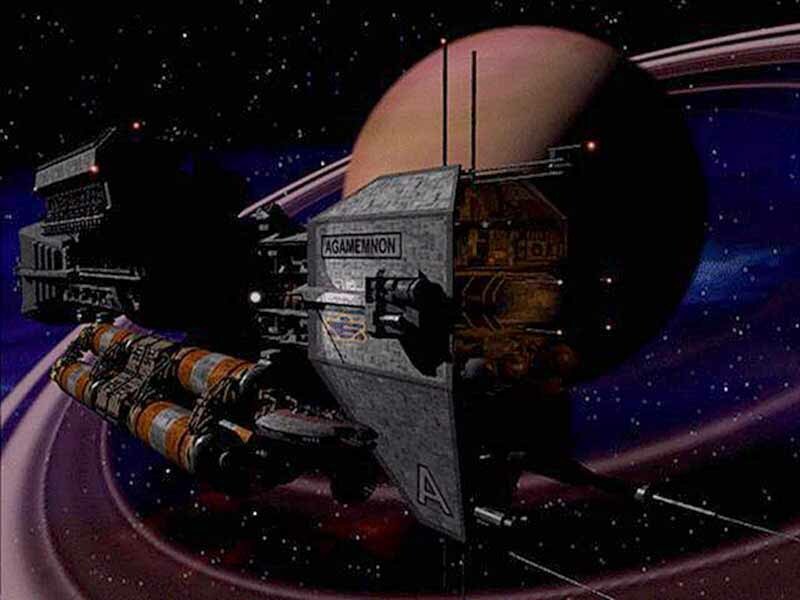 There is no artificial gravity on board any Earth Alliance ship, including these ones. Instead the middle part of a Destroyer rotates to create gravity for he crew. They also carry a large compliment of Starfuries. The Omega Class Destroyers are of course equipped with jump-point generators. 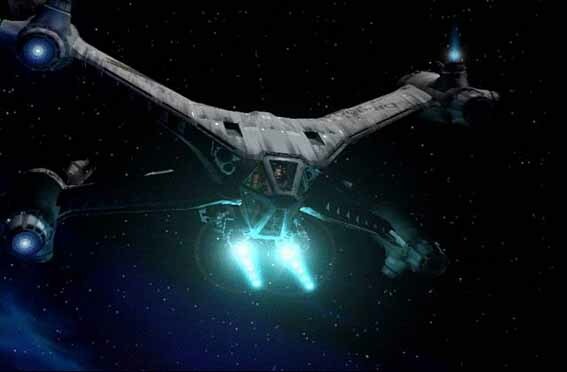 Description: The Hyperion Class Heavy Cruiser is one of the oldest Earth Alliance ships still in service, (together with the older Starfuries) and they were all built before the Minbari war. Almost all of them were destroyed in the war, but many of them survived, and those who did have since then been upgraded with better weapons. There is neither artificial gravity nor a rotating section on board, so the crew works in micro-gravity. This makes these ships only suitable for shorter missions, while the crews on the large Omega Destroyers with rotating sections can stay out for longer patrols. The Heavy Cruiser also carries Starfuries on board, and it is the smallest Earth Alliance ship that can open their own jump-point. The Hyperion Class has also recently been upgraded, so that they can carry beam weapons and otherwise improved weaponry. 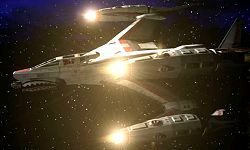 Description: The Earth Alliance Starfury Class fighters are uniquely for designed mamximum efficiency in space combat. With the pilot located in the center, and 4 redirectable engines located at the end of 4 "wings", the Starfury is amazingly maneuverable. The Pilot "stands up" in the cockpit, which is the best position for most acceleration. The design itself is not very new, it existed before the Minbari war, but upgrades have continually been made. It is lightly armed and protected, but very quick and maneuverable. Description: The newest Earth Alliance fighter is the Thunderbolt, a heavily modified and improved Starfury design. It is much more aerodynamic, capable of atmospheric as well as space combat. It has small fins mounted on the engines that are extended during atmospheric flight to improve control. It is also equipped with a powerful rapid-fire cannon, and it has a crew of two, with the co-pilot sitting behind the pilot. 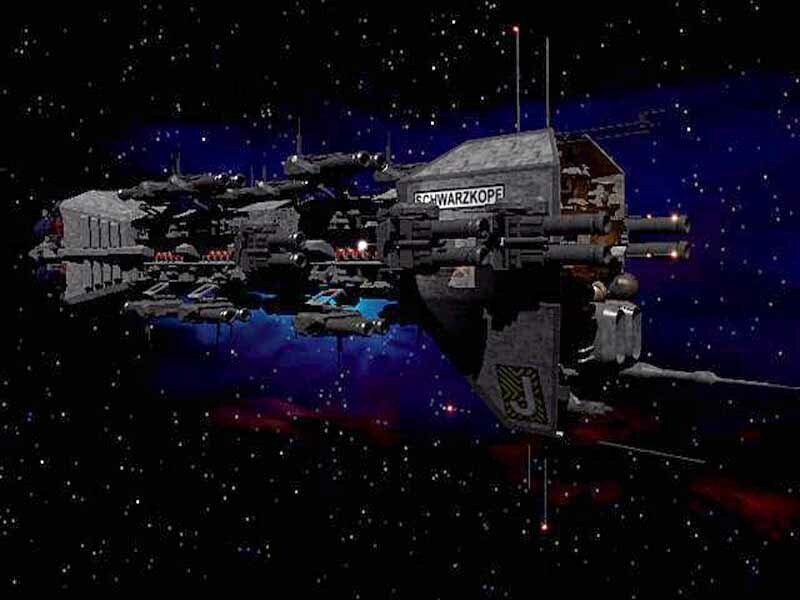 Description: The Nova Class was earth-force's biggest and most powerful ships during the Minbari war, but still inferior to all the Minbari ships. Since then this class of ships have been refitted and more built. The newer Omega Class design was based on the Nova Class to save development costs. This class is heavily armed, and mostly provides support for combat units. These ships are also capable of some planetary bombardment. Like the Omega Class, these ships can also open up their own jump-points.